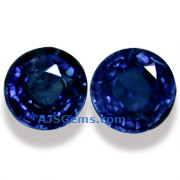 We have 2 pairs of these fine 3 x 3 mm blue sapphires available. Size and weight may vary slightly. To order more than 1 pair, add the item to your cart and adjust the quantity on the shopping cart page.